When a Chinese friend of my Father-In-Law found out that I love tea, she generously gave me a special Xihu Long Jing to try. I couldn't believe that she gave me such a lovely gift. My experience with green tea is still limited, and I'm grateful to have this one to try. She gave it to me during a difficult time, and the gift lifted my spirits. I hope I can someday reciprocate and give her a tea that I enjoy. 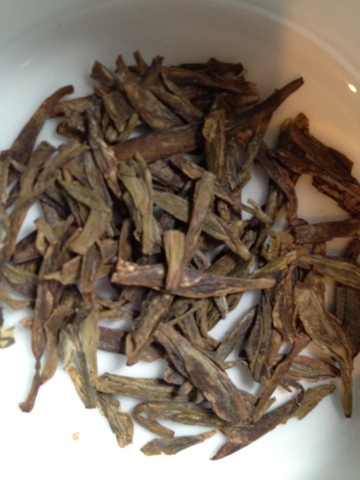 In doing a little quick research I learned Long Jing or Dragon Well tea is named, "after a well that contains relatively dense water, and after rain the lighter rainwater floating on its surface sometimes exhibits a sinuous and twisting boundary with the well water, which is supposed to resemble the movement of a traditional Chinese dragon." (taken from http://www.jiangtea.com/green-tea/xi-hu-long-jing/ where you can learn even more interesting information about this tea). 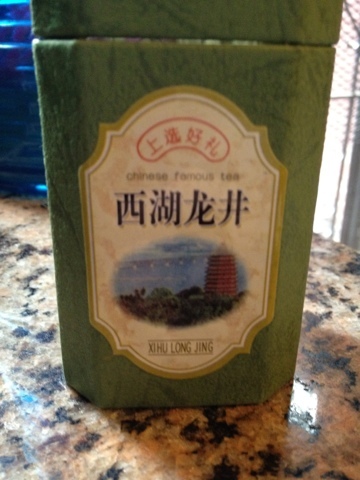 The leaves are long and flat, similar to other Long Jing teas I've tried. The shape is due to pan firing. This tea has a lovely nutty aroma that reminded me of roasted cut grass. It is a delicate tea, and I tried to brew the it carefully. I used water that was off the boil in order to coax a proper flavor. 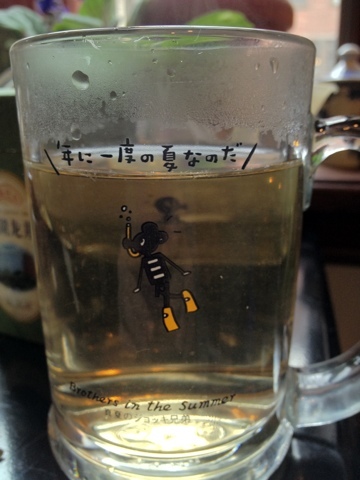 If the water is too hot it can 'cook' the tea and impart an unpleasant taste. The prepared tea has a subtle, smooth vegetal taste that has a nice depth to it. It reminds me of sitting in a spring meadow surrounded by tall, fresh grass. A high quality green tea. It finishes with a slightly roasted taste that is similar to oolong. It is a comforting cup. I tried the tea on a typically chaotic day, so I didn't get to finish while it was still hot. When I tasted the lukewarm tea, it actually had a more dynamic taste. The flavors were stronger, more obvious to me. I always prefer my tea just above 'warm', so perhaps this is how my palate prefers to taste things? I've mentioned this phenomena before, and it is intriguing. Since this tea held its flavors so well cold, it would be fantastic in the summer as an iced drink. This is a delicious tea and I am so grateful to have it in my cupboard! I love how tea can bring people together, even when they barely know one another. In my experience, when two people discover a shared love for tea, an immediate bond is formed. I often participate in 'tea swaps' sending and receiving surprise packages of tea with someone I've never met before. It's a great way to get exposed to new teas, and meet new people.